I love you, and I always will. But… you’ve changed. Just a bit. You grew up and saw more and more people liking you, wanting to see you. Who can blame them, you are amazing. But, it felt as if we had too little ‘just you and me time’. So, I cheated on you with the Nusa’s. Sorry, not sorry. So what are the Nusa’s? The Nusa’s are 3 islands just south of Bali. Nusa Lembongan and Nusa Ceningan have been on the tourist roadmap for quite some time, but still feel like tropical bounty islands with not too much western interference. Nusa Penida is the biggest island and was only opened up to tourists two years ago. All of them are pure heaven and have their own personalities. All worth exploring for some days, some weeks or forever (I can dream, right?). Most boats sail from Sanur, Bali to Jungut Batu on Nusa Lembongan. But it is also possible to grab a boat to Mushroom Bay (where all the fancier hotels are) or directly to Nusa Penida. Going to Nusa Penida is also possible from Padangbai. The cheapest option is going to the harbour in Sanur and negotiate about the price. If you like to book in advance, don’t worry, there are lots of little tour agencies on Bali that sell tickets as well. We paid 500.000 IDR for a return ticket with the fast boat, including pick up in Canggu and drop off in Ubud. A pretty comfortable deal! Going to Nusa Penida from Lembongan is easy to arrange. Head over to the iconic yellow bridge. Here are a ton of people wanting to bring you. Around 50.000 IDR is a normal price, be sure to haggle if they are aiming high. 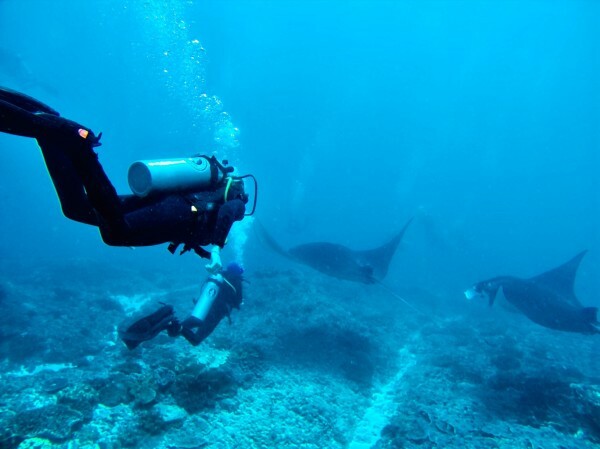 Diving with rays is a highlight! If all of the above sounds like too much work, don’t worry for a second. Lounging on a massive Fatboy while sipping a healthy smoothie, gazing at the ocean, is just as easy. 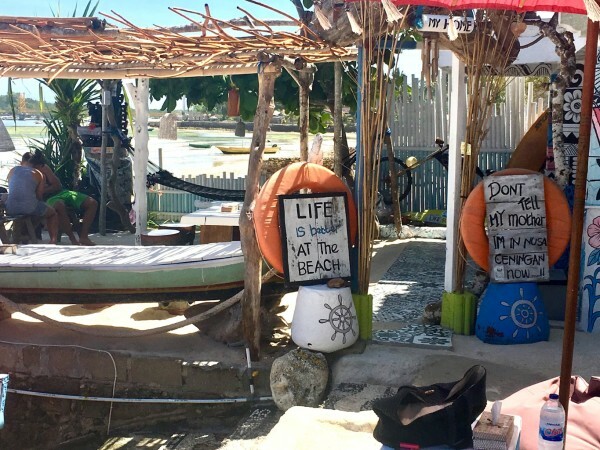 The best place to do so is definitely Ginger & Jamu on Jungut Batu beach. Caring about the environment, they don’t do plastic. Paper straws, cotton napkins and glass water bottles. Oh right and amazing smoothies, sandwiches, smoothie-bowls and salads. 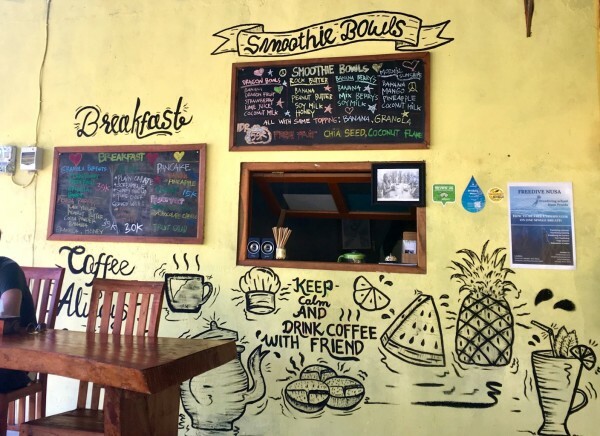 Combined with the yoga school above the cafe this place oozes the ultimate zen and friendly vibe. I admit, I’ve spend days full of relaxing, drinking, eating and plunging in to the sea for some refreshment at Ginger & Jamu. Another amazing spot is Sea breeze Ceningan. Their catchy latino tunes, hammocks and perfect vanilla ice coffees cannot do anything else but make you happy. Overlooking the azure seaweed-farms with your toes in the sand, beach life as it should be. Also, their wifi is really good, thus digital nomad proof! For dinner the choices are endless. For dinner the choices are endless. There are a ton of nice warungs for local dishes. Not so local are the nanchos and burritos at Ginger Moon (whats in a name), but they cannot be missed! Getting around Lembongan and Ceningan is best done by motorbike. The roads are generally okay and even the bumpy ones are do-able. Nice places to scooter to include dream beach, devil’s tears, mahana point and the blue lagoon. Now, are these two islands going to break your wallet? Hell no! There are tons of affordable homestays. Your own little bungalow -some even with a swimming pool and breakfast- usually comes with a price tag of between 13 and 20 euro a night. 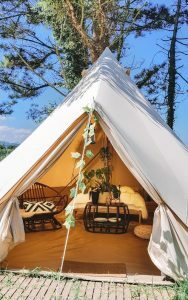 Although more luxurious places are also widely available. I highly recommend Jiva Bungalows: basic but clean bungalows, super sweet people and a nice breakfast included! 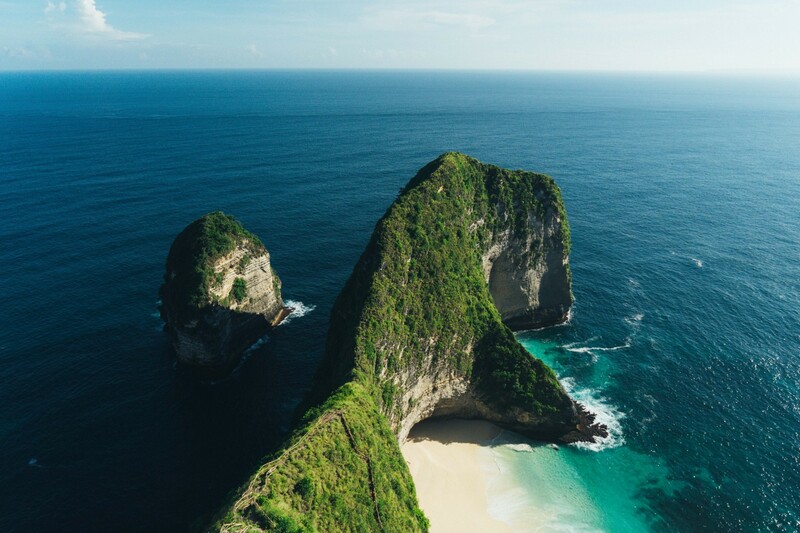 Now if you are up for a little less relaxing and a bit more adventure, Nusa Penida is the perfect pick. It’s possible to do day trips from Lembongan, but staying on the island for a few days is definitely better. Penida is much more quiet, less developed and wilder then little sisters Lembongan and Ceningan. That’s great for adventure, but also a bit more dangerous. They are working on the roads, but a lot of them are still treacherous. Going for a daytrip? Then seriously consider hiring a car with a driver as the highlights are further apart and driving hastily really isn’t a good idea. Still rather have a scooter to drive around yourself? Then make sure to check it before renting. Good brakes are a must on the steep and rocky roads that are home to Penida! As this island isn’t open to tourists for that long, it’s not filled with restaurants and bars yet. But every village has a couple of gems. Whatever you do, don’t miss breakfast/brunch/lunch at Penida Espresso. The smells from their kitchen are heaven and the rock butter smoothie bowl is to die for. The island has an amazing coastline, high cliffs, hidden beaches and views that go on forever. 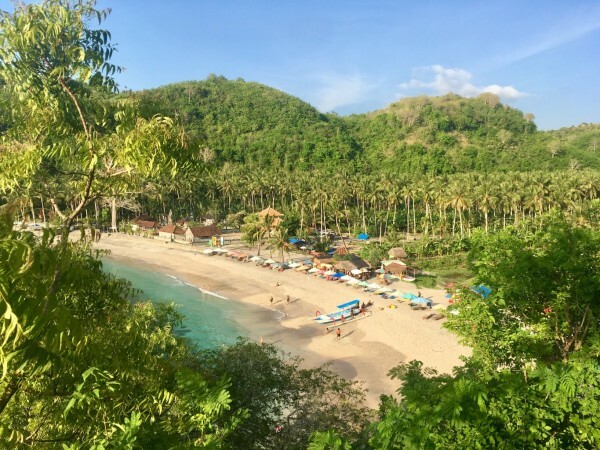 Take a day to drive the beautiful road to Atuh beach, take the steep stairs down and chill on one of the loungers to watch the change of the tide. Another great place is broken beach. The name is a bit confusing as there is absolutely no beach but it’s a sight to behold. Next to broken beach is Angels Billabong. It seems as if the pictures you find online are massively photoshopped and don’t depict the real thing. I dare to say Angels Billabong was the disappointment of my trip through Asia so far. But hey, go see for yourself! 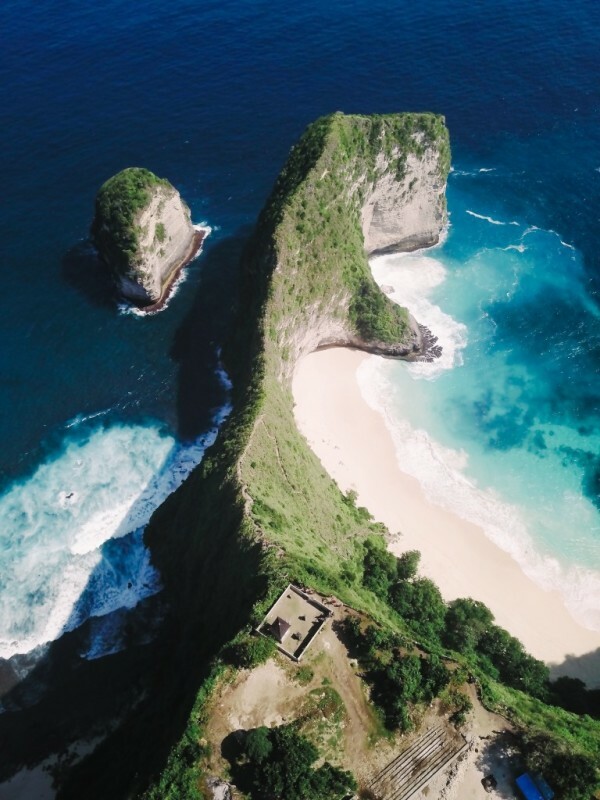 The ultimate highlight of Nusa Penida has got to be Kelingking beach. A massive cliff looking down onto the purest of beaches with the bluest of waters. It’s impossible to describe this beauty in words. There is a way down to that perfect beach, but it is quite dangerous so be careful! Of course you can also relax at Nusa Penida. Crystal Bay is your bae! Although it has some real steep hills, the road to Crystal is perfect and very Instagram worthy, lined with picture perfect palm trees. You can rent two sun-beds and an umbrella to protect you from the sun for just 50.000 IDR a day. The little warung at the western end of the beach makes you a great mie goreng! 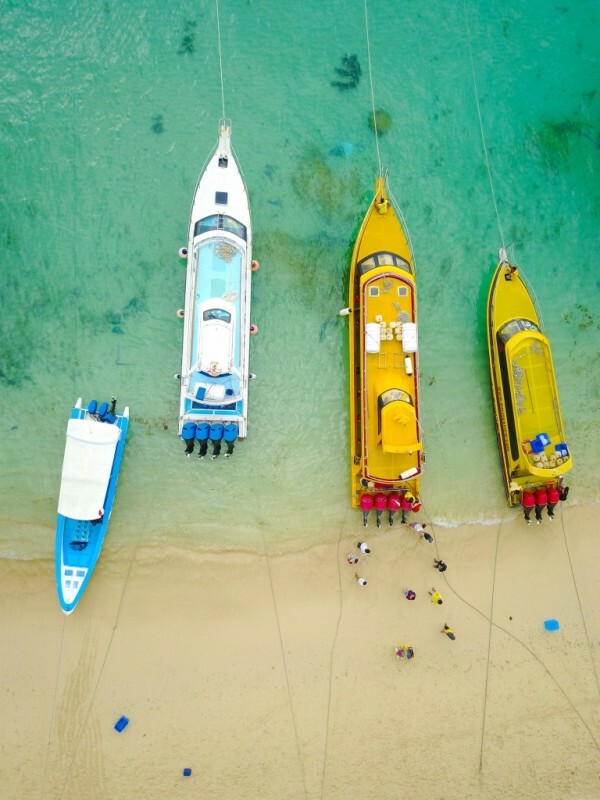 Don’t forget your snorkeling gear, the underwater life really is crystal clear and includes many curious, colorful fishes and even the occasional turtle. Do check the current as it can be strong here! End your day with a cocktail or a beer at Penida Colada while looking at the Agung volcano, just across the sea on Bali. Life is pretty damn perfect here. Now, don’t skip Bali just yet. But consider spending some time with the Nusa’s to fill up one some peace, quiet and happiness. Maybe I see you there as I might never leave again. *Our guest editor Jill is currently traveling through Asia and will monthly update us about her Asian adventures.